This is my first post on this blog. I am so honored that bother yam asked me to be a partner in this venture. I blog about everything random at The Middle Way and about biking in San Diego here. If one were to ask my 18 year old self if I would be cooking every meal from scratch and getting so much joy from the act of cooking not just for myself, but for friends and other strangers...I would have laughed and then possibly gotten very offended at the very idea. So in a span of 10 years I find it quite amazing that food is a subject that I spend a considerable amount of time on. The act of preparing meals is one that is so gratifying that I cannot imagine doing anything else when I cook meals. How did I begin cooking? The answer is very simple, I was getting homesick for homecooked meals. I was craving the beef masala from my grandmother...where every single piece of meat was marinated and then slow cooked over a wood burning stove. I was craving fried sardines - sardines marinated in a variety of Indian spices and pan fried over a wood burning stove. I craved egg masala curry - boiled eggs marinated in a coconut based curry. The reality of these meals entering my senses was remote. And no restaurant that I knew catered to my taste buds the way my mother or grandmother did. So I began the monumental task of trying to figure out how to satisfy my craving. It was monumental because I despise being in the kitchen. As a feminist of the 21st century I thought it was beneath me to learn how to tool around in the kitchen. No, I was destined to follow a much higher calling...that of a paper pusher. My initial attempts were not really disasters per say. But the beef was over cooked and raw sardines were impossible to find. I was stuck with figuring out how to make egg curry. And I eventually learned how to make the egg curry my tastebuds craved. It had carmelized onions and the exact level of spiciness, and a coconut milk based curry that went well with not just chappatis but also rice. Below is my basic recipe for that egg curry. Boil eggs and set aside after removing shells. Fry onions chopped lengthwise along with minced garlic and minced ginger in vegetable oil. Add chopped tomatoes and spices. Finally add the coconut milk and let the curry simmer. Add the eggs. Slicing the eggs in half and dropping them in the curry will allow the eggs to absorb much of the flavor and spices. Serve with chappatis (flat bread) or over rice. That sound really good. Do you make your own garam masala? I love reading your blogs. I'm not so good at contributing. Cooking with you would be a blast! Since we are not able to eat/smell the food the least we can get are some pictures!! That said the food sounds great! 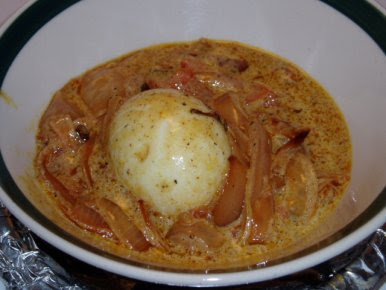 Oh crikey, I love me some egg curry. Beany, this is a hell of first post! Sue: To date I have no made my own garam masala, but I do modify the ones I buy by adding whatever spice I feel it needs more of. I never have gotten my own spice grinder but I plan to soon. Glad to see your comment. Cooking with you would be a blast! One of these years we will. ATTW: Your request for pictures has been granted. The picture is very old (5 years old), but the recipe still yields yumminess. bother yam: Thanks Mr. Yam. This gives me reason to cook this and then eat this! !